If It’s Not an Elephant Tusk It’s a(n)…..? Ok, so maybe it’s not so difficult to guess what is in this post’s photo, but it makes at least two people think of an elephant tusk (sort of). Coming up within the next two weeks — another mention of the 1940s and the Pocahontas, Iowa, grain elevator. Click photo once (or even twice) to magnify detail. This entry was posted on February 28, 2010 at 3:27 pm and is filed under Photography. You can follow any responses to this entry through the RSS 2.0 feed. You can skip to the end and leave a response. Pinging is currently not allowed. 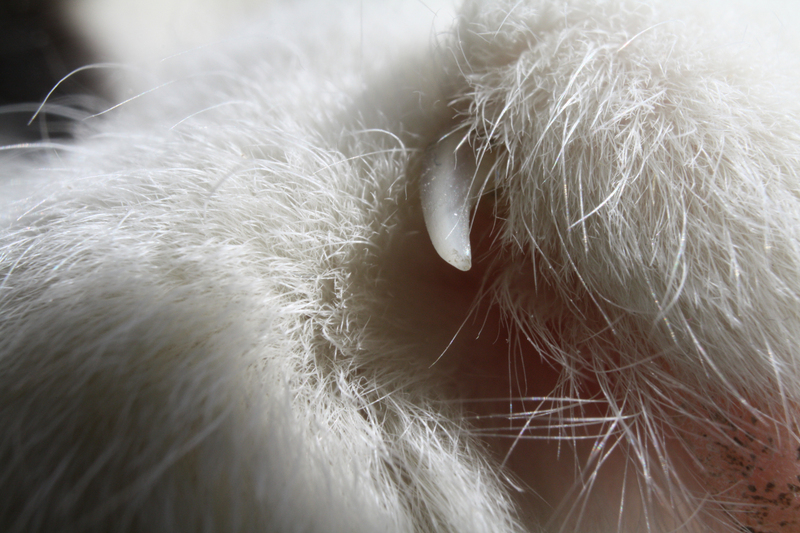 It’s a claw on a cat’s paw. Clara, you win the prize! Yes, it is one of Miss Kitty’s claws. She was surprisingly patient, letting me photograph her in four different “photo shoots”! Two of the times she got into the house accidentally when the plumber must have left the door ajar, letting Miss Kitty slink in. After that, I was on a mission to improve the focus on my photos, so brought her in two more times. Even I thought I was crazy to be in different contortions on the floor photographing her paws! Even though I’m not a cat aficionado, I recognized the claw because I’ve been inside my car when Mouser has walked across the windshield. Thus, I’ve seen a cat’s claw up close. I can just visualize you being in your car at Gunderland and Mouser on the windshield!